Welcome to the winter issue of the quarterly Marche Voyager newsletter with a cockle-warming concoction from Fano, traffic news, a good reason not to watch TV, and a little sermon to end on. And wishing you all a good Christmas and a peaceful 2012. A caffè corretto, a shot of espresso coffee cut with strong liquor, is an invigorating staple in bars across Italy, but at Fano in the northern Marche it reaches an art form with the local moretta. This potent cocktail is a blend of three spirits - aniseed-based anice, rum and brandy - sugar and a twist of lemon peel, topped up with strong, hot coffee. It should be prepared with care to keep three layers - the spirits, the coffee and the fine foam on top - and is always served in a small, clear glass. The drink is said to originate amongst the fishermen and sailors at the port of Fano to keep them warm at work. 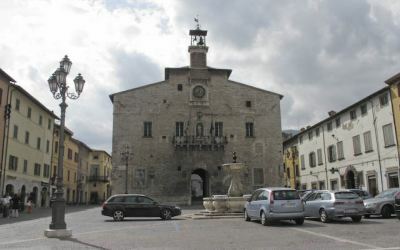 This month's image of one of the region's 500 or so piazze features the main square in Cagli in the northern Marche. The fine renaissance town hall stands centre stage behind the gaily tinkling fountain. Le Marche has again been one of the few Italian regions to see an annual increase in the number of tourists. This summer (June to August) saw 1.9 million tourists arriving in the region, almost 2 percent more than the same period last year. The number of foreign visitors rose by a remarkable 6.8 percent. Work to create a third lane on the A14 toll motorway (or "expressway" for our American readers) between Rimini and Porto Sant'Elpidio appears well on schedule; short stretches of the 154 kilometres to be widened have already been completed and the bulk of the work is set to be finished by 2014. The project also includes the creation of five new junctions (from north to south: Pesaro Sud, Fano Nord, Marina di Monte Marciano, Ancona Ovest, and Porto Sant'Elpidio). More details on the autostrade.it site (in Italian). Expect a last minute rush at local electronics shops as television broadcasting in the region goes digital. The "switch off" in Le Marche, when the old analog transmissions cease, making way for digital terrestrial transmission, is scheduled to take place between 5 to 21 December. To see the delights of Christmas television you'll need a set-top box (unless you have one of the latest TVs which come ready for digital broadcasts) and likely need to get your antenna replaced or adjusted. You can, of course, ignore all this if you already have satellite TV, or simply have better things to do than watch the box. Full details for the regional switch over on this website (in Italian). How much is that truffle in the window? The white truffle season is still in full swing in Le Marche. But if you want to indulge before the season ends on 31 December, bear in mind that prices this year for the sought after Tuber magnatum pico, or white truffle, have reached over Euro 3,000 per kilo. Expect bills in restaurants serving tartufi bianchi to be heavily "seasoned". An 84-page PDF document with the latest statistics on the region in English is available for download here. Subjects covered range from population growth to forest fires and industry to transport. Police authorities in the region have recently been carrying out investigations to identify illegal holiday rentals, and owners who rent out their properties without proper authorization from their local comune risk serious fines as well as claims for unpaid tax. They may also faces fines of up to Euro 1,800 for failing to register guests with the local police. Absolutely anyone offering accommodation, including B&Bs, must register all guests within 24 hours of their arrival. This can now be done online so is hardly onerous - unless, of course, your aim is to evade paying tax. If people tell you none of this is necessary, you should be aware that more and more owners of rental properties who do play by the rules are getting tired of the unfair competition from those who don't, and are ever keener to help the authorities stamp out such illegal activity. If your property is advertised on the web, it isn't hard for others to check if it's in regola. There are four universities in the Marche - Urbino, Ancona, Camerino and Macerata. Camerino claims to be the oldest, dating back to 1336, while Ancona was only founded in 1969.